First they were underweight, with underwhelming numbers. Then they weren’t there at all. Then they were coming in late, showing up as Upper Cook Inlet fishermen were packing up their gear for the season. On Aug. 23, in response to late incoming fish passing the Kenai River sonar, The Alaska Department of Fish and Game opened Drift Area 1 — a broad fishing area between the Anchor Point Light and Kalgin Island in the middle of the inlet — to drifting. Despite the opening and the numbers of sockeye passing the sonar in the river, fishermen only picked up 209 sockeye in that opening. By comparison, they picked up 1,105 silvers, which have reportedly been running well in Cook Inlet this year, despite the poor numbers of sockeye, king and pink salmon. The managers were expecting the sockeye catch to be better, said Brian Marston, the area management biologist for the Division of Commercial Fisheries in Soldotna. The silver run has been a little better than usual this year, providing a small extra buffer for fishermen. Most Kenai River sportfishermen have been switching from sockeye to silvers as well, with guides grateful that the silver run has been strong enough to support angler effort with a weak or closed sockeye fishery. Biologists have been puzzling over what happened with the Gulf of Alaska sockeye this year. Weak king salmon runs weren’t uniform across the gulf, and since 2008, Alaskans have been adjusting to a reality with fewer king salmon in it. But sockeye are normally plentiful, and this year presented some firsts. Chignik’s commercial fishermen, for example, never opened, earning a disaster declaration from Gov. Bill Walker before the summer was even over. The poor runs of sockeye have happened in some rivers before, but the complete closure is a first for Chignik, said Bill Templin, the chief fisheries scientist for Fish and Game’s division of commercial fisheries. Other fisheries have been seeing a late burst, like the Kenai, and the commercial fishermen have been able to take some advantage, such as the Copper River and in Kodiak. Those fisheries have been seeing a sharp underperformance in pink salmon fisheries, too, though, as they did in 2016 when a federal disaster was declared and for which $56 million was appropriated by Congress for impacted stakeholders. So far, indications seem to point to ocean conditions unfavorable for survival. Research through the Chinook Salmon Research Initiative for the last five years has provided good tracking and life history data on ocean survival for king salmon, but the department hasn’t been doing the same kind of research for sockeye salmon, Templin said. But even then, there are some mysterious snags — while one sockeye stock may have come back poorly this year, a neighboring stream would do just fine. 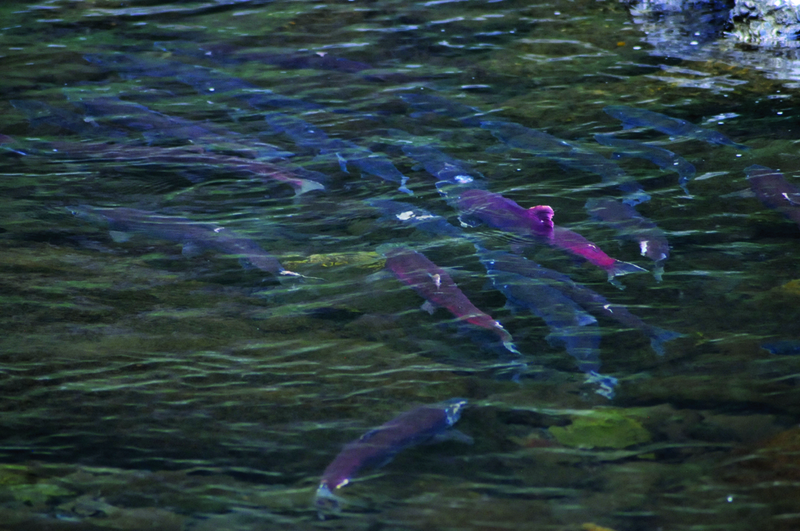 Next door to the Kenai River, the Kasilof River’s sockeye run handily made its escapement goal this year with harvest and increased bag limits. In the case of the Kasilof, that may be because the main cohort for that river is largely four-year-old fish as opposed to five-year-old fish being the norm on the Kenai, Marston said. The department staff will do more analysis after the season about the run, but so far it looks like the fish caught were for the most part smaller than usual. The Kasilof River escapement goal for sockeye was exceeded in part because of concerns for the Kenai run that restricted the commercial fleet. More fish escaped into the Kasilof, so even though the run itself wasn’t that large, more fish made it into the river, Marston said. Some fishermen have still been out harvesting silvers, but in a fishery that depends almost entirely on sockeye for the majority of its value, this season was a hard one for Upper Cook Inlet fishermen. “It’s hard to make (that sockeye catch) up,” Marston said.